Mr Heusele, the manager of Dragées Braquier in Verdun, is the exact opposite of the product he makes. whereas his sugar coated-almonds are sweet on the outside but bitter inside, Mr Heusele first comes across as surly but after half an hour you realize he is the sweetest man. 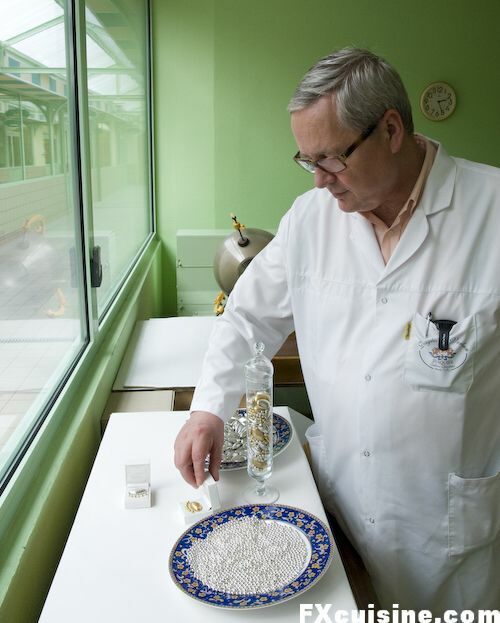 He took me on a private tour of the largest dragée factory in Verdun. After the interview, Mr Heusele said he was sure he knew me. I said it's unlikely, but in the end we realized he had seen me on French TV a couple times. What a small world! This bought me two free boxes of beautiful dragées, and then I bought as much as I could fit in my car from the factory shop. People have been coating almonds in honey since the Romans, but since the 1300s Verdun became the European center of sugar-coated almonds. These were said to have as many health benefits as the vitamin supplements we guys buy today, including those of increasing fertily. 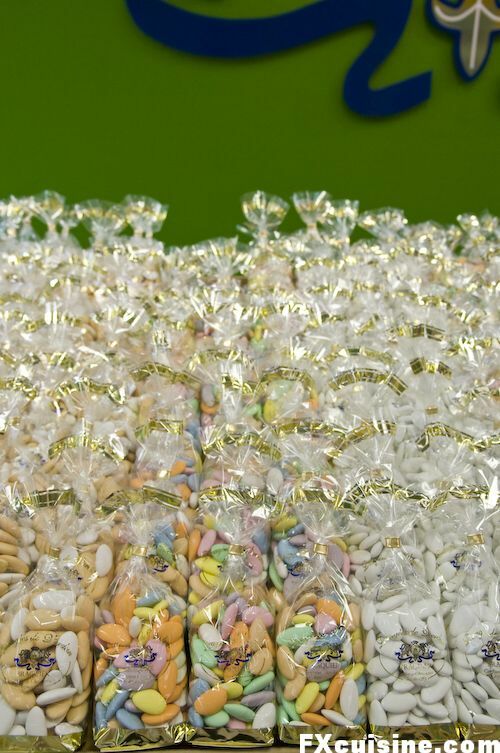 Naturally, dragées became a traditional gift at weddings and baptisms. The the Italy-born French queen Catherine de Medisis started eating dragées and offering them to her guests, a powerful endorsement for the product if it were. Mr Heusele started the tour with the almond-picking room. 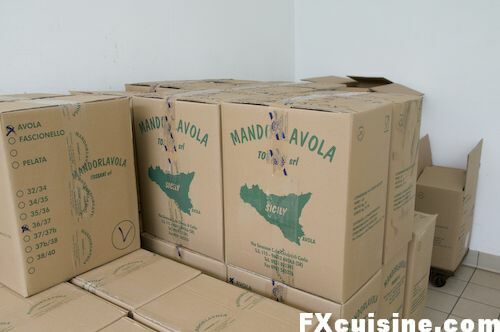 We only use almonds from Avola, a village in Sicily. 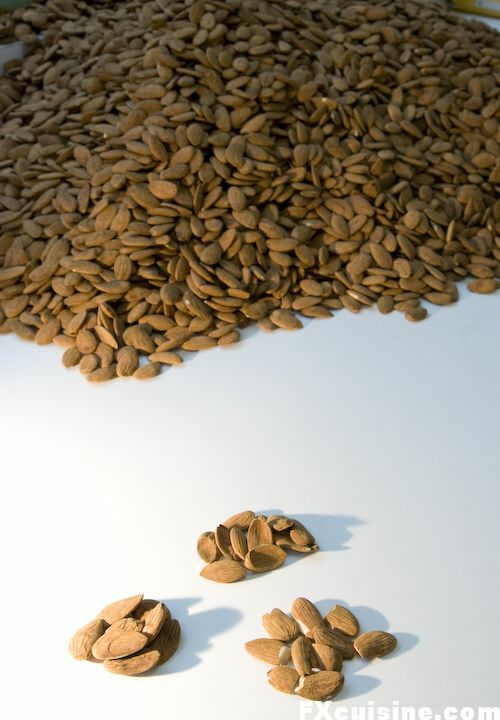 They are the most expensive in the business, €20 a kilogram wholesale. But our Sicilians friends send us all of their almonds and only some of them look good enough to make a proper dragée. 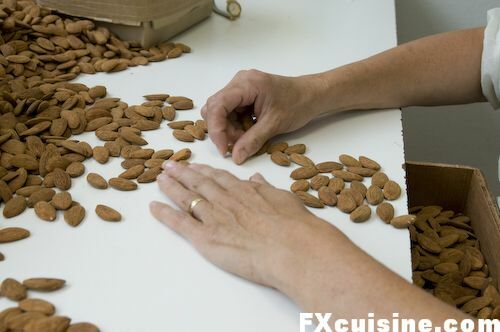 So this lady's job is to sort tons of almonds by hand. She looks at each almond and decides what her fate will be. Plump, shapely almonds get to be coated in sugar and offered at weddings. Almonds that deviate from the established standards of physical beauty are mercilessly sent to be crushed and caramelized into nougatine. There are three types of defective almonds in this business. Clockwise from the bottom left: "twins", "twisted" or "domed". We store our almonds at 6°C (42°F) otherwise they are damaged by mites, explains Heusele. 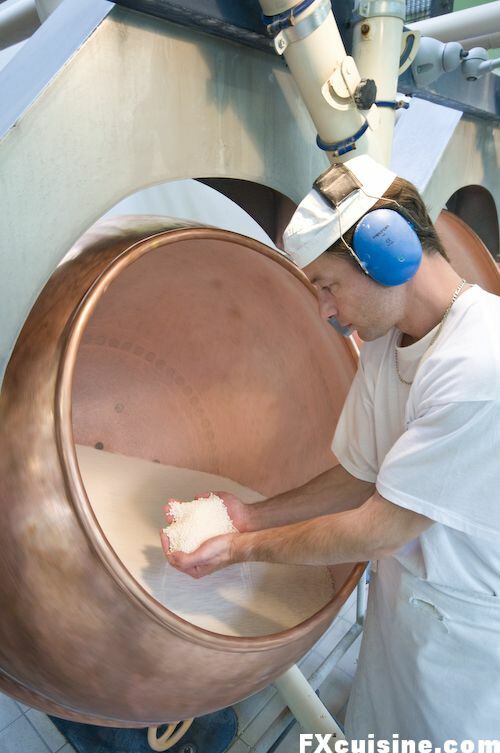 With 16 employees, Braquier makes 100 tons of candies a year. 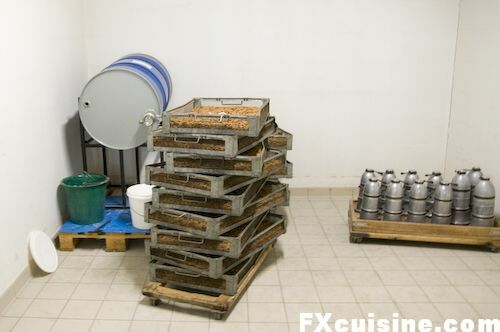 Before the almonds are processed, they spend 6 hours in a hot room at 65°C (150°F) for drying. Then the almonds are covered with gum arabic to prevent any almond oil from seeping out and tainting the finished dragée. 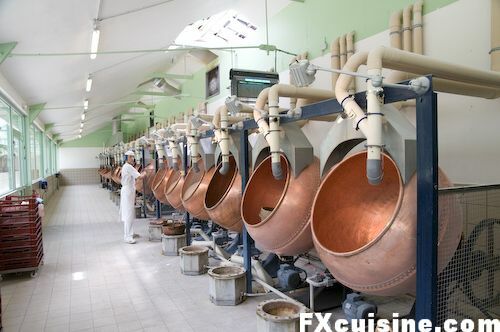 A syrup is prepared with water and sugar and boiled in a large copper wat with a false bottom where steam circulates. Here we see the washing in hot water, the syrup itself makes less steam. 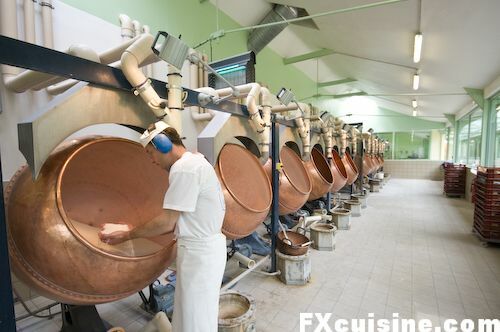 The picked, dried and gummed almonds are carried to a long room where dozens of large copper drums revolve slowly. The sugar syrup is added one ladle at a time and the gentle circular movement gradually coats the almonds with sugar and polish them to a smooth finish at the same time. When they are sufficiently coated, a final dose of sugar syrup with a little coloring is added to make them pink, or green or blue. 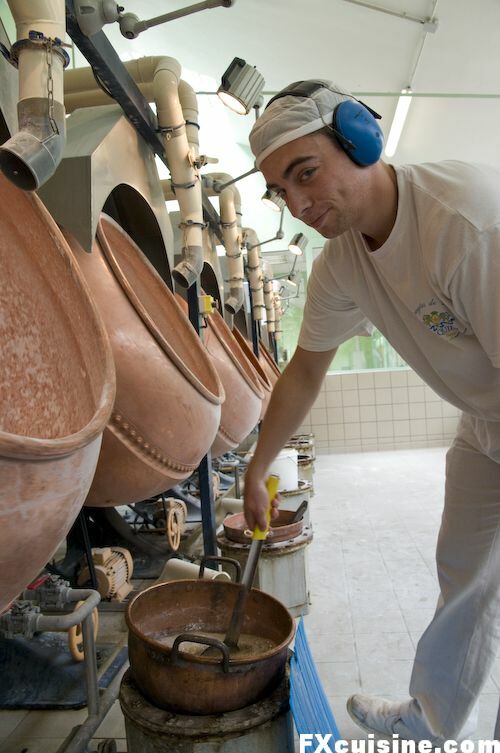 The same drums are used to make all sorts of sweet candies, included sugar coated hazelnuts, cocoa almonds and chocolate bonbons. I kind of like this room! Mr Heusele takes me into the central corridor while I admire the architecture. We refurbished the factory recently, it's all clean an modern and light now., he explains modestly. 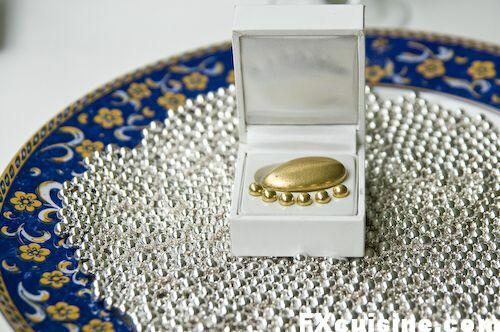 These beautiful gilded sugar-coated almonds are sold in jewelry boxes, mostly in Dubai. A delicious way to eat through your savings! The package room is abuzz with an atmosphere of concentration and work. I ask the man weighting the cocoa coated almonds what is the measurement tolerance. They all laugh, then he answers The point is to always have at least the quantity it says on the box, otherwise we get complaints! 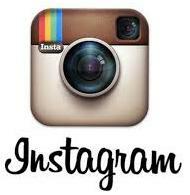 The high season is between Easter and August, when most of the weddings take place. We then make a little incursion into the factory shop, a huge room filled with candies of every color known to man. But these are not the industrial crap-candies soaked with chemicals we can see in some city shops. These are all artisan candies, made by hand where each almond is known by her first name. 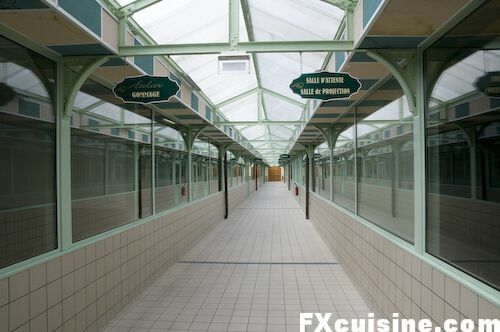 For luxury candies, they are quite cheap here at the factory. I fill my trunk with the most improbable combinations of sugar and almonds, pay and go back to see the most intriguing product made at Braquier. Click below to read the second part of this article - the edible exploding artillery shell.